Every year after the full moons of late summer, something exciting happens on the reefs of the Florida Keys — corals reproduce. Coral colonies, preparing to build reefs for the future, will release their gametes (eggs and sperm) simultaneously in a spectacular underwater show. Using the lunar cycle, scientists are able to predict when specific types of corals will most likely reproduce, or spawn. For divers and snorkelers lucky enough to witness a coral spawn, it’s a memory to last a lifetime. 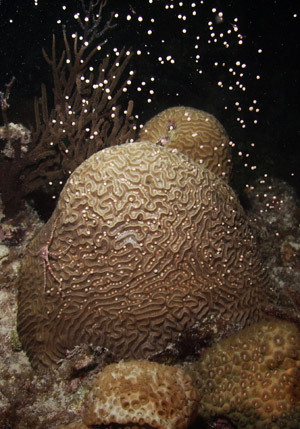 In 2011, coral reef scientists are predicting that Florida Keys boulder corals — such as brain and star corals — will be spawning six to eight nights after the August full moon, August 19 through 21. For branching corals — like the protected elkhorn and staghorn — scientists are anticipating them to spawn two to five nights after the full moon, August 15 through 18. Sometimes corals will release just their male gametes, which will then be fertilized inside female coral polyps. But, the most impressive sight is the more common “broadcast spawn” where male and female gametes are released in unison to mix and fertilize in the water column and float to the surface. The fertilized baby corals will drift in the ocean currents for weeks before settling on the seafloor where they will hopefully grow into new reefs. Divers interested in viewing Mother Nature’s romance at work should be prepared for a late evening of night diving, and be patient. While scientists have narrowed down the window of coral spawn nights, much of the timing is still a mystery and can be affected by weather and other environmental factors. As spawning begins, keep an eye out for tiny white, pink or orange spheres rising out of the center of each coral polyp, coral colonies which appear to be “smoking,” and the frenzied behavior of nearby fish. Divers aren’t the only ones interested in spawning corals. Fish and marine life are in tune with this cycle, too, and eagerly await the spawn so they can feed on the gametes. Fortunately, the nature of the large broadcast spawn actually gives baby corals the advantage against hungry predators. Much of the fun of coral spawn is watching the entire reef community come alive for the celebration, and the feast. This year, NOAA scientists will return to the sanctuary’s reefs for coral spawn as they have since 1994 to collect fertilized gametes for further study of how baby corals grow.